By finding air leaks in your home and plugging them, you can take a bite out of your energy costs. You don’t have to spend a lot of money; in fact, you can skip the expensive window replacement and start with some cheaper fixes. Although installing well-fitted, triple-paned, argon-filled windows with low-e glass is an energy-smart move, you can follow some simpler steps to block air leaks and bring a faster return on investment. Cover windows with heavy drapes or honeycomb-style blinds. Caulk leaks around windows and doors. An inexpensive ropy caulk (under $10 in most home and hardware stores) is really fun to use — kind of like playing with clay. 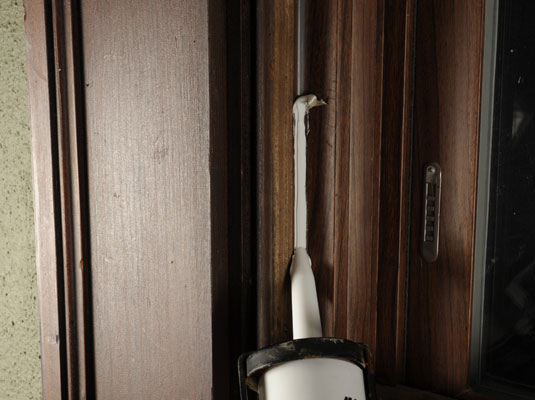 Applying new caulk is one of the easiest ways to seal leaks and keep the warm air inside. Tightly close the flue damper in your fireplace when not in use. Insulate switchplates on outside walls with thin foam pads that slip behind the plates—found in home and hardware stores for less than $10. Check other places where leaks might occur: outside water faucets, kitchen and bathroom vents, and other heating vents and ducts throughout the house.